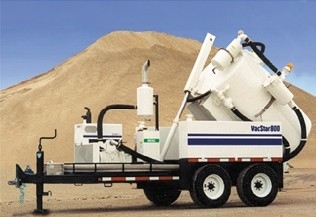 The Vacstar line of vacuum excavation equipment is designed to locate underground utilities safely and quickly, as well as clean culverts, treatment plants, meter boxes, etc. The Vacstar is designed for an operator to have curbside operations, which makes running the vac easier and safer for your operators. Superior engineering uses a rotary vane pump as opposed to a blower (used by most others), which means many advantages for the operator. The Vacstar's rotary vane pump creates a deeper vacuum, costs less, demands less horsepower and has a better tolerance for foreign material than blowers. Antifreeze kits are standard with all Vacstar's to maintain your water when the working environment is cold. The gasoline Vacstar is engineered with two separate engines for running the vac pump and the water pump. This design prevents excessive wear and the "pulling down" that can occur when only one engine is used. An operator can also use the water pump to clean the work site, equipment, etc., without using the larger engine.